Shibuya, with its blaring signs, constant traffic clamor and frenetic crowds is not usually the first neighborhood I think of when looking for a place to have a satisfying meal in a pleasant environment. But recently, I have had good reason to head there not once, but twice, for both lunch and dinner – the improbably named Ryan. 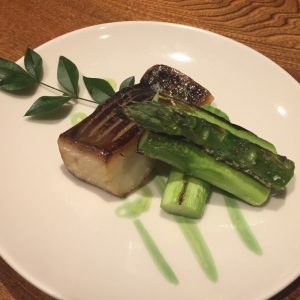 Situated on a side street just off Miyamasuzaka, an avenue which winds its way uphill from Shibuya station towards Aoyama, Ryan is one of those hard-to-find restaurants that serve an eclectic mix of both Japanese and western-style dishes in a sophisticated, contemporary atmosphere. But the stylish interior and creative cuisine served here hardly conjure up the life of a hermit. The atmosphere is closer to what you might expect of a fashionable New York bar than a casual Japanese restaurant. So, it’s not surprising to find out that Ryan’s management team is headed by Shinpei Terada, whose stable of restaurants includes some of Tokyo’s trendiest eateries, such as TY Harbor in Tennozu and Cicada in Omotesando. 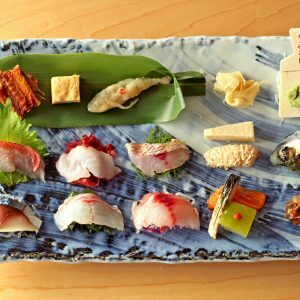 For lunch there is a choice of two courses – named Oak and Cedar – and a chef’s recommendation course (omakase). The dinner menu also features the Cedar course at Y6,000 and the Oak course, for bigger eaters, at Y9,000 – as well as a wide variety of á la carte dishes, ranging from an appetizer of fried shishito green peppers in a sauce of sansho (prickly ash or Japanese pepper) and sesame soy sauce (Y600) to a main dish of grilled burdock wrapped in slices of wagyu (Japanese beef) sirloin (Y1,800). 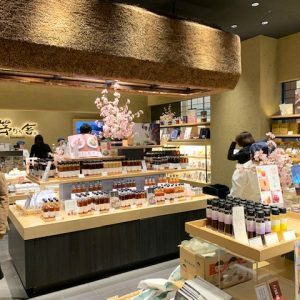 Ryan also stocks a range of sake, including organic sake, or what they call “non-pesticide sake,” and wines, including organic and Japanese wines. 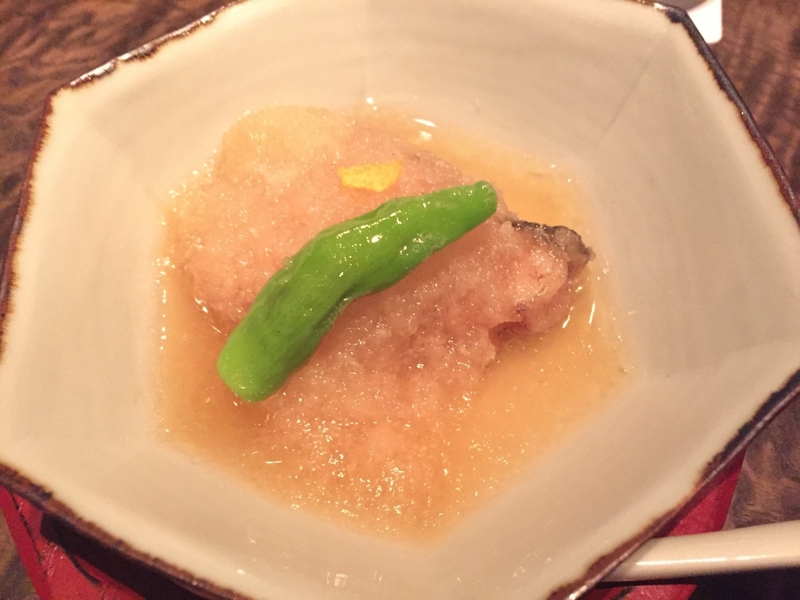 On a recent visit for dinner, we opted for the Oak course, which featured several traditional Japanese dishes revamped with a contemporary twist. The first course was one of my favorite dishes – a smooth and rich sesame tofu (goma-dofu) –topped with a dollop of sea urchin (uni) that gave it an added boost of flavor, and, of course, the all-important wasabi garnish. 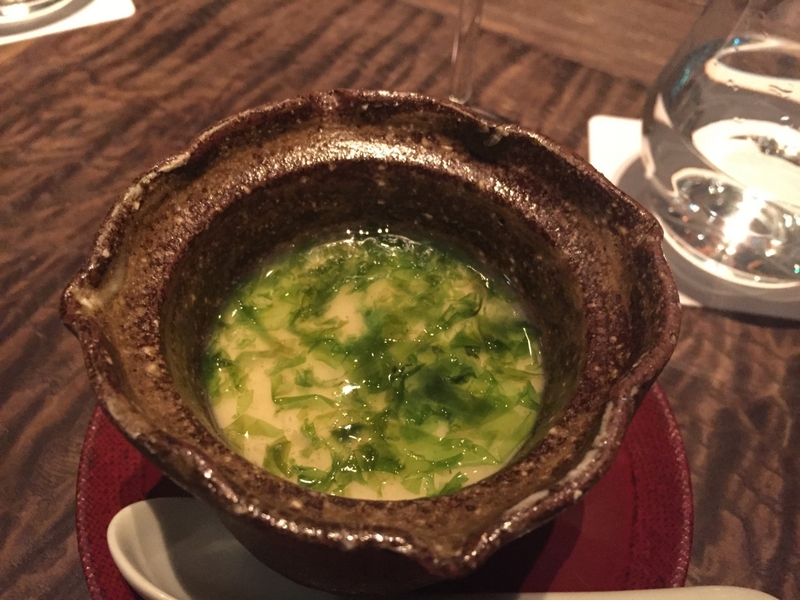 This was followed by a chawanmushi, a savory egg pudding flavored with hamaguri clam dashi, or bonito broth. The soft, silky texture of the egg contrasted nicely with the succulent pieces of hamaguri clams inside and the fresh seaweed (nama-nori) gave the dish both color and additional umami. The fresh seaweed complements the flavor of the hamaguri clams in the chawanmushi. The sashimi course that evening consisted of flounder (hirame), squid (ika), tuna (maguro), abalone (hotate) and mackerel (saba). In an unusual touch, the sashimi was served with both wasabi and dijon mustard, which complemented the mackerel particularly well. 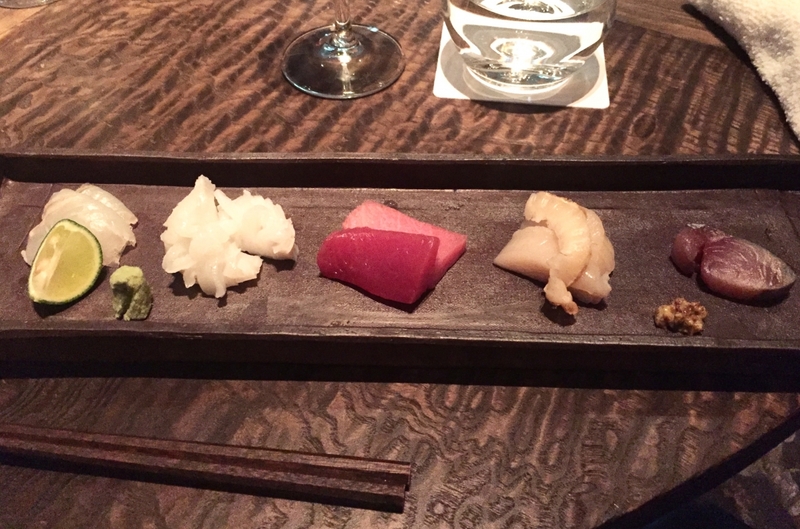 A simple presentation of fresh sashimi. 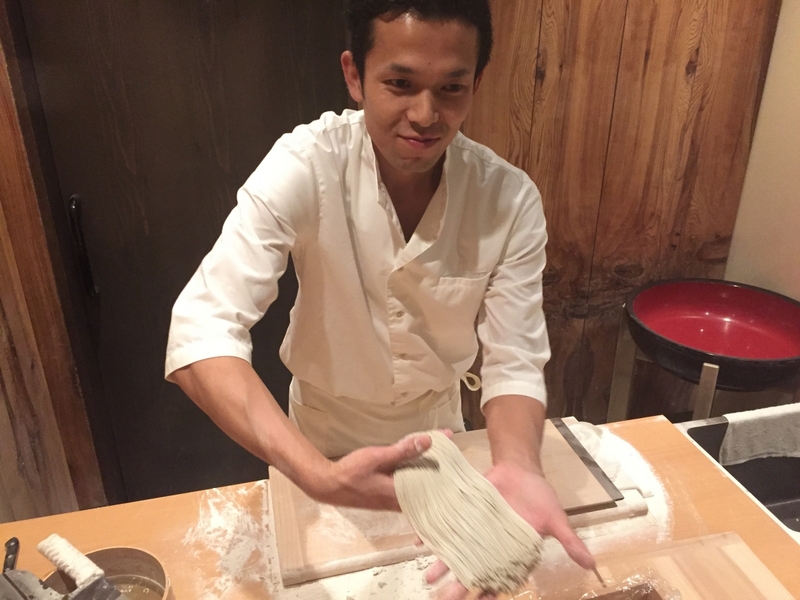 What is most improbable about Ryan is not immediately apparent: it is actually a soba restaurant, complete with a display area in the back of the restaurant where it is possible to watch the soba chef knead, flatten and deftly cut the buckwheat dough into fine noodles. I know well that this is actually much, much harder to do than it looks – my husband, who is quite dexterous, tried it once and the soba noodles turned out more like tagliatelle than the thin strands they are supposed to be. It takes real skill to cut the soba dough into such fine strands. Ryan’s soba, which uses eight parts buckwheat flour and two parts wheat flour, was among the best I have sampled. It was al dente, but not in the least chewy and delightfully flavorful. 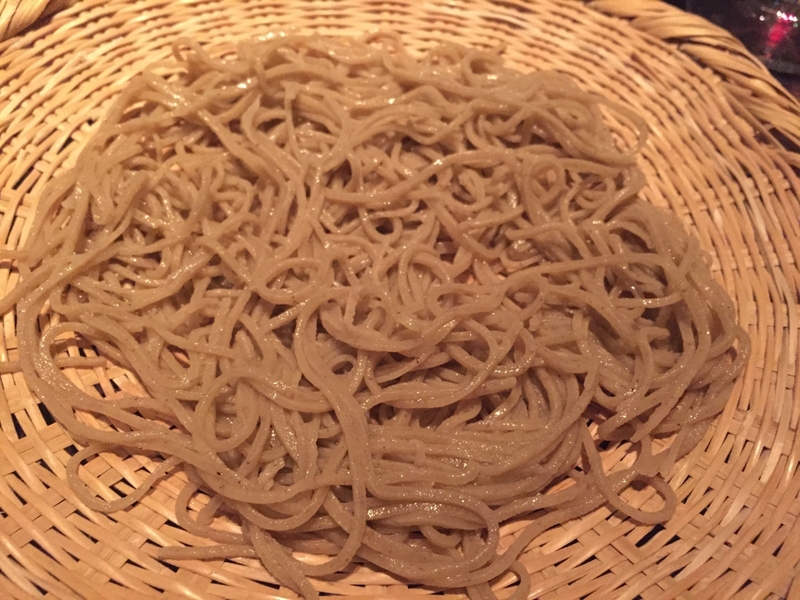 So, while it is unusual to serve soba in the middle of a meal, we were delighted to be presented with a dish of cold soba to be dipped in sesame sauce as our fourth course. This was topped with thin slices of radish, another unusual touch, which added a slight kick to the overall experience. 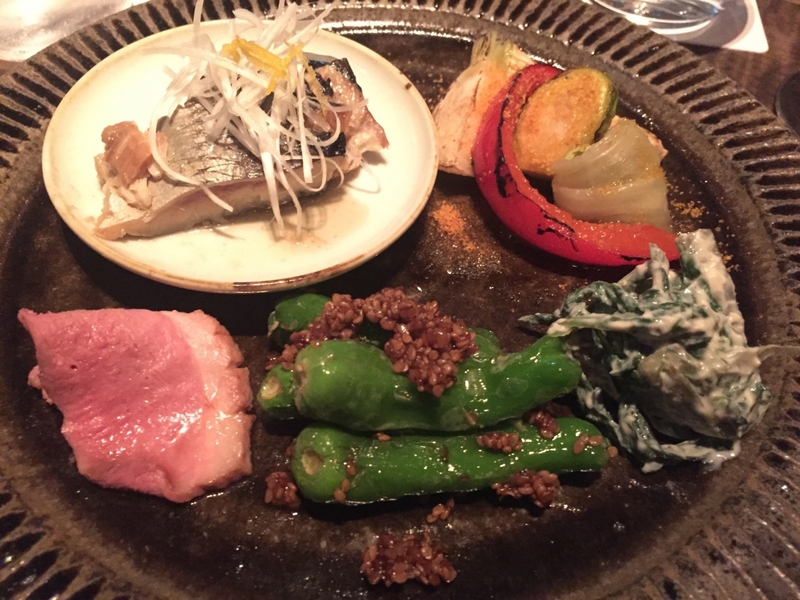 The next course was a selection of grilled morsels – mackerel, vegetables, a slice of duck, shishito green peppers with a sauce of sesame, Japanese sansho pepper and soy sauce and a salad of edible chrysanthemum leaves (shungikku) in a tofu sauce. It was rather overwhelming at first sight, but surprisingly, everything was light enough that I managed to consume most of the food without feeling overfed. The grilled shishito peppers were particularly tasty. Then came the main course: a dish of fried cod (tara) hiding under a generous heap of grated daikon radish and topped with a fresh-looking bright green shishito pepper. A slice of yuzu lemon adds a refreshing touch to the fried cod. 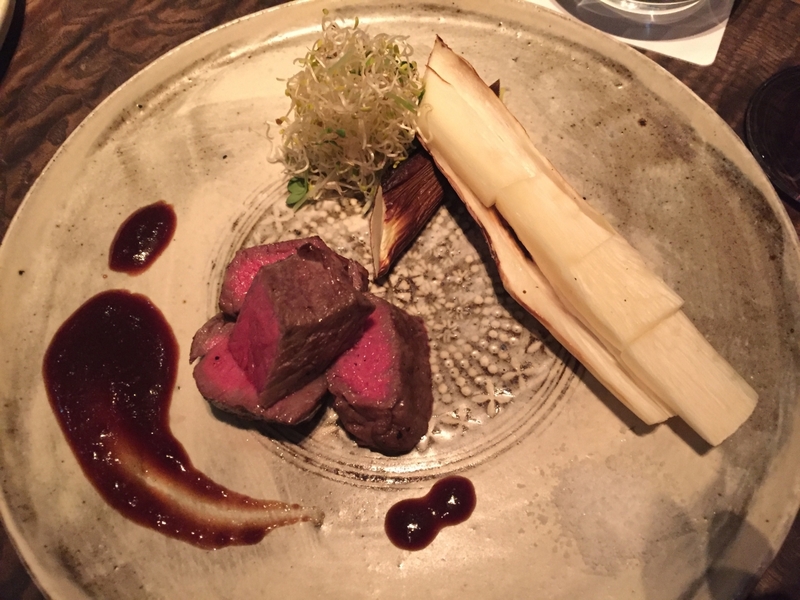 The main course was not what one would ever expect to be served in a self-proclaimed soba restaurant — grilled Japanese black beef (kuroge wagyu) with a sauce of wine and soy sauce and a side of grilled wild rice stem (makomodake). Not your typical soba restaurant offering. The wild rice stem is similar in texture to bamboo shoot, although softer, and has the slight sweetness of corn. Before dessert we were served a generous portion of freshly prepared cold soba noodles, which we dipped into cups of cold soy-based soba sauce. Soba somehow slips easily down your throat even after a filling meal. 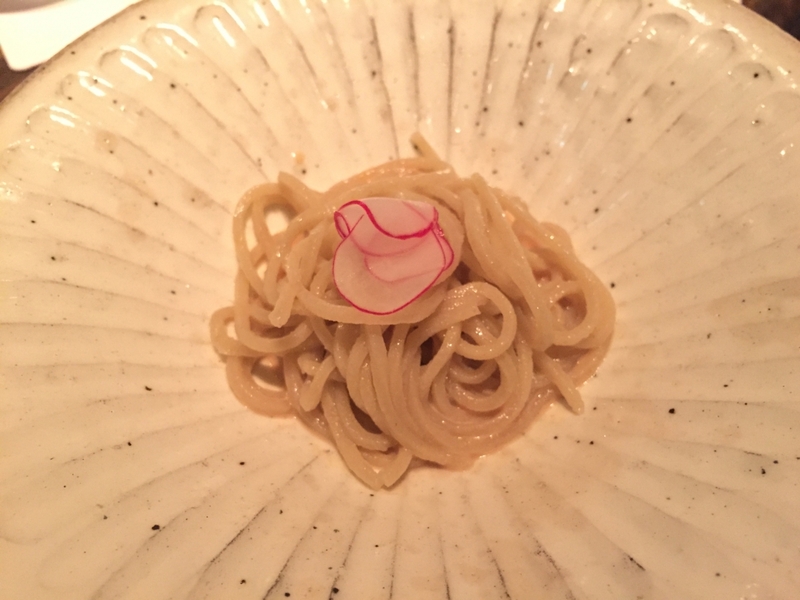 I am not exactly a soba fanatic, but Ryan’s soba has me hooked and with so many other well-prepared dishes and an interesting range of sakes and wines to choose from, I am sure I will be returning often to this chic but unassuming eatery.